Disclaimer: This article assumes some knowledge of Oracle Document Capture (ODC) and Oracle Forms Recognition (OFR). Also, dependency on the Oracle AP Solution Accelerator is expected as well. 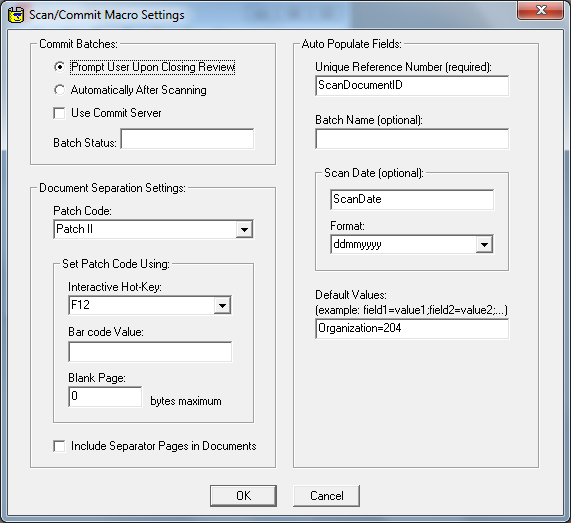 This blog will provide an example of how to use the provided scan macro to set static values without any customizations to the macro. 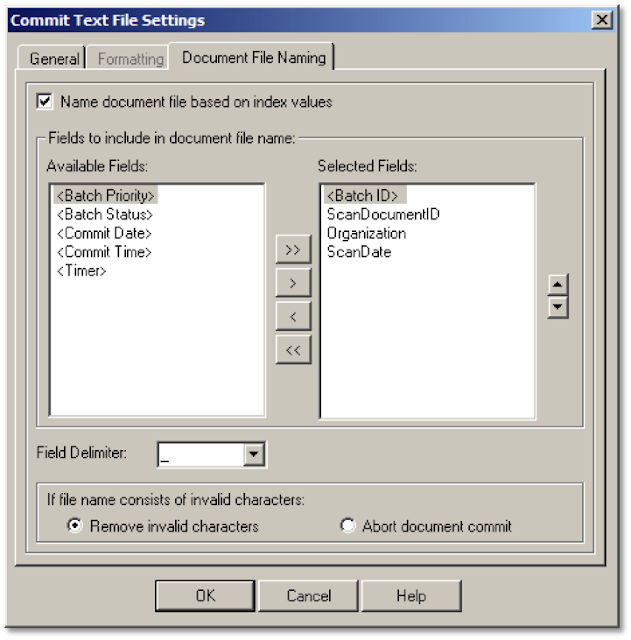 This sample will use an ODC variable named 'Organization' to map to the OFR existing 'CompanyCode' header. Finally it will be exported in the OFR export .xml as the 'orgID' element. b. Select the category of "Scan for ISIS"
3. 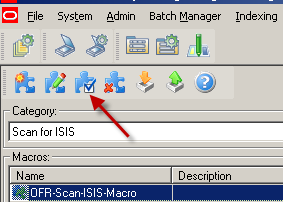 Using the AP Accelerator, there will be an existing macro named "OFR-Scan-ISIS-Macro"
i. The default accelerator file cabinet is "Invoices - OFR"
i. The default accelerator commit profile is "OFR Commit"
e. Make sure that the Organization is set in the "Selected Fields"
iii. Again, the delimiter is the '_' field. ii. Using the exposed variable, <%CCO>, will allow for the addition of the Header Company Code into the output. This wraps up the walkthrough. Thanks for reading! You can check in a metadata placeholder without specifying a primary file by entering an invalid path in the Primary File field. 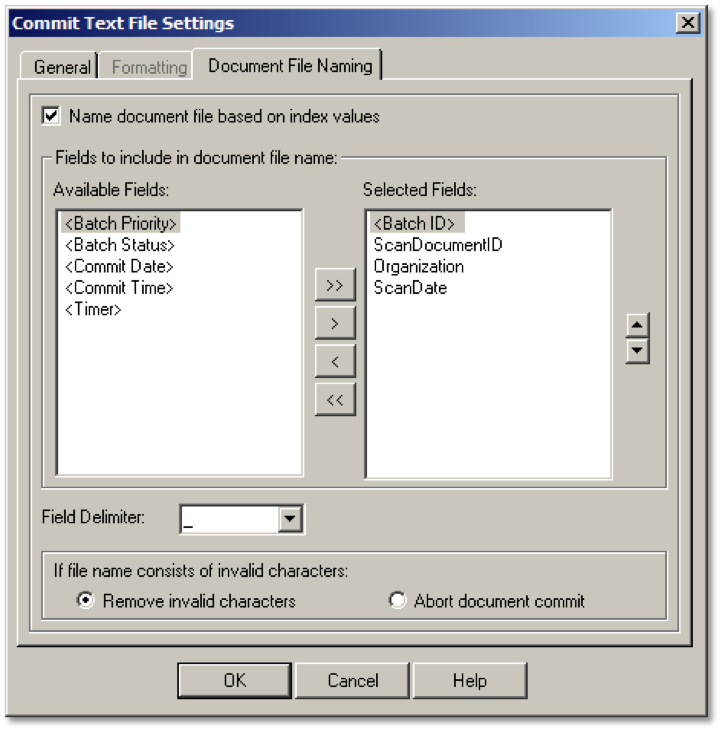 For example, entering the word placeholder into the Primary File field creates a content item within Content Server with the specified metadata, but no indexed primary file. Placeholders are useful for initiating workflows or making metadata available for searching and discussion. If you do not specify a valid drive, an error message is displayed. Pretty clever way of forcing a meta-only content item without the configurations in place! It's always worth reading the docs! Bug 16243790 - AXF EBS R12 adapter doesn't differentiate between balance segments and other types of segments. This change also requires 16245122. Bug 16051792 -The GetDocumentPermissions service is being called too many times (part 3 of a multi-part fix). Bug 14822845 - When using the URL Tool, ExecuteSearch, the link generated by the eMail button on the search results screen givs the wrong results when executed. This also affects Image Searching from PeopleSoft as this utilizies this URL tool. Bug 14137629 - When creating a text annotation, the font is too small. The default font will now be Arial, point size 12. Bug 16243790 - AXF EBS R12 adapter doesn't differentiate between balance segments and other types of segments. Bug 10271381 - Error on import application where it fails to import. Bug 10644977 - An issue in AXF where the Auto Task mode fails when using the Enumeration Picker. Bug 11663155 - Basic viewer can fail when attempting to render an image via URL without the size of the image in the URL. Bug 11780032 - A SQL Syntax Error Exception is being recored sometimes when attempting to search by a Date field. Bug 11893266 - The Goto Page Number box is empty when attempting to view 2 pdfs both of which are over 10 pages long and you are on the last page of the second one. Bug 11934578 - Remove warning when attempting to work on a AXF project in JDeveloper. Bug 11934679 - Change the Segment Editor to initilize segments with default values. Bug 11934687 - Chagne the Segment lookup to respect Segment Dependency models.